Sometimes I feel that the only time I can hear myself think is early in the morning, when the world is still asleep. Then, there is no one to interrupt the steady train of important musings that go through my head like: What is the meaning of life? What will we have for dinner? Should we be making more long term investments? Should I get a new laptop? When will I finally make no-knead bread? Why can’t we all just get along? In the silence of the early hours, the answers to these questions seem almost within my reach…if not staring right at me. (Love, tinapang bangus*, yes, yes, next week, start with me). As the day wears on, the din of work, errands, cooking, washing my snazzy new top, coordinating schedules drown out all but the most persistent of thoughts (what will we have for dinner?). Don’t get me wrong, I do love the wonderful clamour of friends and loved ones, but we all need a little quiet time (me-time) for just us. Unfortunately, it’s not that easy for this body to get out of bed in those early hours, so these important questions are often left unanswered. (Hence the lack no-knead bread on this blog or sophisticated financial instruments in my life – although I’m happy to report the new laptop did make it). Most days I just launch myself head-on into the racket of everyday. This breakfast is good for both – early-waking, slow-blooming days, as well as rapid-rise, hit-the-ground-running days. 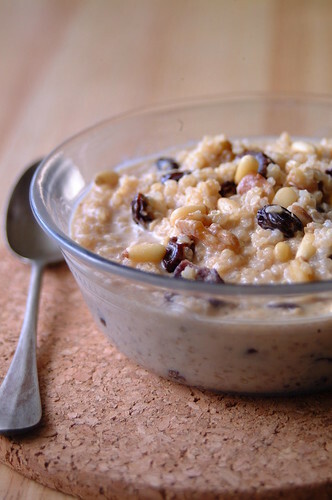 – Place prepared quinoa in a small saucepan with milk, butter, honey, dried fruit, and nuts. – Simmer, stirring often, until thickened slightly…about 5 minutes. I learned about quinoa through (where else?) food blogs and, as I love grains of all kinds (although quinoa is technically a seed – but I love those too), kept my eyes peeled. I found some last year in ThreeSixty, and organic grocery in Hong Kong, and have since found it in a health food store here…and have been loving it from that day. For someone who has eaten (white) rice with almost every meal of her life, it is liberating to suddenly have more choices! Especially one as pleasingly nutty and springy and cute (little curlicue!) as quinoa. And did I mention healthy? And ancient (referred to as the Mother Grain by the Incas)? Learn more here and here. I’ve had quinoa in other savoury preparations but when I saw this breakfast dish I knew I had to try it! And Michelle’s enticing photo was proof that resistance would be futile. I’m glad I didn’t resist. Earthy, comforting, fortifying…with a steadfast “back-to-basics” quality with every bite. Not to mention delicious! This is a simple recipe with which you can play — add spice when cooking (Michelle uses cinnamon) or top with fresh fruit before eating! *Tinapang bangus is smoked milkfish…much loved in our household!